Lot 9: Inverted Glass Saucer Color: Light Aqua Description: Crudely made, with some flaking on the base. Please note that this lot does NOT include the ramshorn hook. You are ONLY bidding on the item shown in view 2. A different angle is seen in view 3. The Inverted Glass Saucer is approximately 2 3/8" in diameter and 1" tall. A few of these are known in the hobby and have been considered intriguing "what's-its" for years. Last year, Jeff Katchko was able to definitively identify its use. For over a decade Jeff has been researching, hiking and digging along the Erie Railroad in Pennsylvania. While working a section of line, he found shards of glass and assumed they were from Lefferts Hooks, which were used on this section. To his surprise, he dug up an embossed Goodyear Ramshorn with a complete "donut" piece of glass still attached to it with some mucilage. Mystery solved! The photo (view 4) shows Jeff holding it in his hand after he pulled it from the ground. A total of four complete units were found. What is even more amazing is that The Telegraph in America in 1877 shows the diagram (view 5) of this configuration. The description in the book reads: "The pin and glass in one form or another was the accepted style. Almost the sole exception to this was a plan adopted, to a certain extent, in an effort to prevent the extensive breakage of insulators, but which was only partially successful. 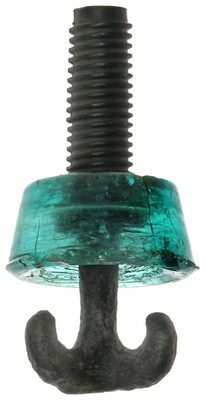 This was the employment of the hard rubber-covered hook and stem insulator in connection with an inverted glass saucer. The imperfect character of the rubber soon made the insulator worthless." What a truly great discovery! Add this inverted glass saucer to your early telegraph collection!